If you are an online video addict and you always follow the latest videoclips of your favorite artists, the latest talk shows or series, you will probably want to have the option to download these videos and be able to view them on any device. The major problem arises when the majority of devices that we can currently find on the market aren't capable of playing files with the .flv extension, forcing us to convert the downloaded files to a more compatible format. Plato FLV to Video Audio Converter is an application that will allow us to convert FLV files to all different kinds of video (DivX, Xvid, AVI, WMV, MPG, iPod MP4, PSP, 3GP, Zune, MP4) or audio (MP3, WMA, OGG or WAV) formats, so that they are compatible with any mobile telephone, game console or iPod. The main highlights of this tool are the conversion speed and the final quality of the converted videos (that can be adapted according to the space that we want each file to occupy). 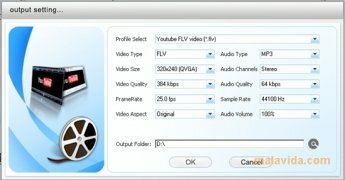 Download Plato FLV to Video Audio Converter and take you favorite online videos with you wherever you go. This is a limited version of the application.